Has Banksy been to South Marston? An item of grafitti has been sprayed onto South Marston Hotel during the evening of Thursday 6th June 2013. Speculation is rife that this could be the work of renowned Bristol-based artist, Banksy. 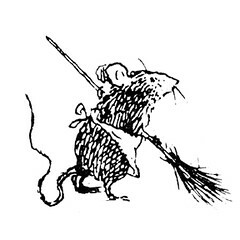 Particularly as this follows on his known rat motif. In light of this, and the consideration of the possible value of such a work, the spray painting has now been covered with perspex to provide some protection. The hotel’s deputy general manager, Steve Goulding, said: “The owner spotted it when he was coming in for a meeting and asked if anyone had seen it. 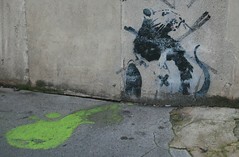 He was jumping about because he is a big Banksy fan and he now wants to know if it is genuine or not. He made sure we covered it with perspex straight away so that nobody could paint over it. It must have been done on Thursday evening or early Friday morning because it was not there on Thursday when we do our usual checks. It just seems a bit weird that he would chose our hotel – he’s from Bristol and that’s where a lot of them are. 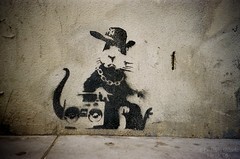 Banksy has become a household name in the world of street art since the turn of the millennium and celebrity owners of his art include Christina Aguilera and Angelina Jolie. One of the first conventional exhibitions of his art was held in a warehouse in 2000, but Banksy gave out only the street number for the building and not the street. A number of fake Banksy’s have appeared as PR stunts across the country and people can now buy stencils of his work online. So what do you think: Is it the real deal, a PR stunt or a fake? Give us your comments.